Is Cisco Systems Inc. Destined for Greatness? Investors love stocks that consistently beat the Street without getting ahead of their fundamentals and risking a meltdown. The best stocks offer sustainable market-beating gains, with robust and improving financial metrics that support strong price growth. Does Cisco Systems, fit the bill? Let's look at what its recent results tell us about its potential for future gains. CSCO Total Return Price data by YCharts. Source: YCharts. * Period begins at end of Q1 (April) 2011. 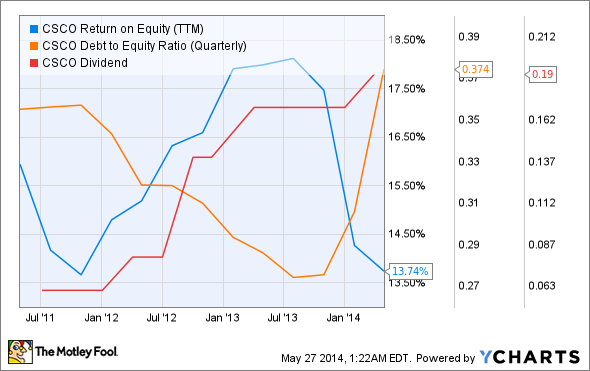 CSCO Return on Equity (TTM) data by YCharts. We looked at Cisco last year, and it has lost two of the six passing grades it earned then to finish with a modest four-of-nine score in its second assessment. The company's sales growth has stumbled amid fierce competition in the networking market, which has also hurt Cisco's profit margin (though only barely) and return on equity. Despite that weakness, a fast-growing dividend has drawn investors into Cisco's stock, which has outpaced the gains in the company's net income since last year, when the situation was quite the opposite. Can this networking giant reclaim its legacy of outperformance in the future, or will Cisco's fundamental weaknesses catch up to it? Let's dig a little deeper to find out. Cisco recently came through with market-topping third-quarter earnings despite declines in revenue and earnings per share as fierce competition from Alcatel-Lucent and Juniper Networks pushes networking equipment costs lower. Cisco also endured a 7% decline in orders from emerging markets, most notably from the BRIC nations. However, the company nonetheless repurchased more than 90 million shares at a cost of approximately $2 billion to prop up its weaker earnings on a per-share basis, and it still holds around $10.1 billion at the ready for further share buybacks. Deutsche Bankupgraded Cisco from hold to buy shortly after the report, citing strong demand for the company;s new platforms in data-center switching, next-generation routing, and security products, as well as a growing wireless and cloud-computing services business. CEO John Chambers recently jumped into the ongoing privacy and government-spying controversy by urging President Barack Obama to end efforts by the National Security Agency to tamper with and infiltrate Cisco's networking devices destined for foreign customers, as the company generates much of its business abroad and can ill-afford to lose its international customers' trust. Fool technology specialist Anders Bylund points out that Edward Snowden's photographic evidence of Cisco routers compromised by NSA-installed "snoopware" has made the Chinese government fearful of spying, which could result in a loss of orders from Chinese companies -- to say nothing of other nations that likely hold similar concerns. Beijing is already shifting orders of networking equipment to Chinese suppliers, dragging on Cisco's fortunes in the rapidly connecting country of more than 1 billion people. Cisco's networking routers-and-switches business has been plagued by the rapid adoption of software-defined networking, or SDN, by major tech companies. My fellow writer Subhadeep Ghose notes that Cisco recently unveiled plans to invest up to $1 billion in a portfolio of cloud-based offerings in an effort to reverse its sagging fortunes. However, the cloud arena is already more competitive than Cisco's home-field industry of networking equipment -- Hewlett-Packard jumped on the cloud bandwagon with a $1 billion investment in its own initiative, HP Helion, and HP now plans to set up 20 data centers by 2015. IBM also plans to invest more than $1.2 billion to build 40 cloud services-based data centers around the world this year. This is only a small slice of the massive cloud buildout that has been led by a number of large-cap tech companies with resources similar to Cisco. But Cisco is hardly abandoning its core hardware segment, as it recently unveiled a new line of switches called Nexus 9000, which already boasts a strong pipeline of orders from over 1,000 customers. Cisco has also invested over $250 million into Internet of Things start-ups, as it believes this market will be worth a whopping $19 trillion by 2020. With nearly $50.5 billion in cash and investments and $20.9 billion in debt, Cisco has a strong financial position from which to make further investments in highly touted new technologies businesses such as SDN, cloud computing, and the Internet of Things. 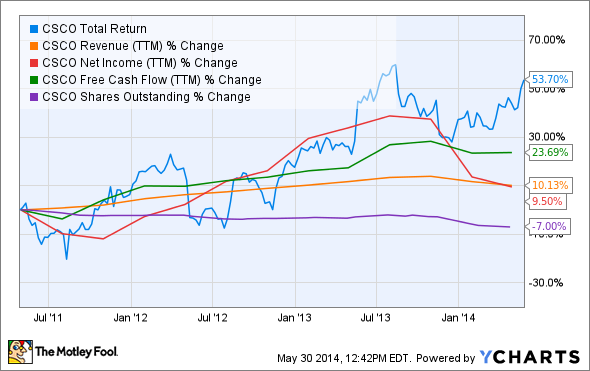 Cisco has some of the qualities that make up a great stock, but no stock is truly perfect. Digging deeper can help you uncover the answers you need to make a great buy -- or to stay away from a stock that's going nowhere. Are you ready for this $14.4 trillion revolution? Have you ever dreamed of traveling back in time and telling your younger self to invest in Apple? Or to load up on Amazon.com at its IPO, and then just keep holding? We haven't mastered time travel, but there is a way to get out ahead of the next big thing. The secret is to find a small-cap "pure-play" and then watch as the industry -- and your company -- enjoy those same explosive returns. Our team of equity analysts has identified one stock that's ready for stunning profits with the growth of a $14.4 TRILLION industry. You can't travel back in time, but you can set up your future. Click here for the whole story in our eye-opening report. The article Is Cisco Systems Inc. Destined for Greatness? originally appeared on Fool.com. Alex Planes has no position in any stocks mentioned. The Motley Fool recommends Cisco Systems. The Motley Fool owns shares of International Business Machines. Try any of our Foolish newsletter services free for 30 days. We Fools may not all hold the same opinions, but we all believe that considering a diverse range of insights makes us better investors. The Motley Fool has a disclosure policy.